This entry was posted on December 10, 2010 at 8:30 am	and is filed under Phillip, Sherman & Stanley. You can follow any responses to this entry through the RSS 2.0 feed. You can leave a response, or trackback from your own site. Sherman my boy, it is better to walk up the stairs than to take the elevator. Oh, our trash can is plastic lined with a paper bag to absorb any spills too. paper & plastic bags for garbage. Pack and carry, the new reusable carrier for the older dog or one undergoing therapy! So Sherman, you dewclawed a ride instead of walking? Hey Sherm. That SO does not count as being a posh purse dog. We don’t do the paper bags, but we do get the plastic and use them in our trash cans as well (All trash cans in our house — and I mean all, not just kitchen trash — need to have lids, or be under/on top of cabinets. Jordan is a good boy, but Josie is a trash eating she-beast). 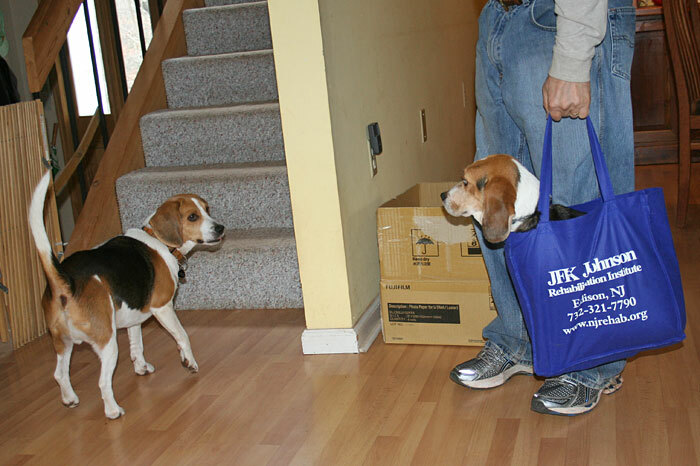 We also reuse produce bags for picking up after the houndz on walks, ensuring they have no holes in them first! They’re much easier to put in your pocket than a regular sized plastic shopping bag with handles. Look what I found in the Pet aisle…with my double coupons, it was only $.99! What a bargin! Dude! When they said you’re going to Rehab, they weren’t kidding! I’m going to hide my stash now! This gets me vote. My captions have been terrible. “WHOA! Dude! blue is your color. It goes well with your…coat.” Walks away snickering. Hey Sherman where have you been? Phillip purchases another snuggly fleece blanket for Laurie, when SHAAAZAAAM… Sherman has already staked his claim…. I maintain that if you reuse anything and everything you can, THAT’S green. We use the reuseable bags, but we also bring home stuff in paper and plastic. But, we use them for a multitude of tasks or we recycle them. You got a beagle instead of bagels!!!!!!!!!!!!!!!!!! He is cute but what will we eat for breakfast tomorrow morning? Cool, we’re going shopping! Let me go upstairs and get MY bag! I am another one who uses the plastic bags from Wal-Mart, Piggly-Wiggly, etc. for wastebasket liners and pickup bags during beagle walks. By the way, to weigh in a little late on the reusable bags issue, I used to use plastic bags so I could use them as trash bags. But then our city started a 5 cent bag tax! So now I use reusable grocery bags and purchase my trash bags. I don’t know if it’s more or less expensive but I have principles, man.